Researchers from the University of Houston have created an artificial skin that can enable robots to feel hot and cold temperatures. Researchers from the University of Houston have created an artificial skin that can enable robots to feel hot and cold temperatures. The discovery could eventually lead to better surgical gloves, health monitors, and more. A team of researchers from the University of Houston have created a new type of “skin” that allows robotic limbs to feel hot and cold. While still in development, it could potentially give those with prosthetic limbs the ability to feel again, as well as lead to more advanced medical equipment. Assistant Professor of mechanical engineering Cunjiang Yu and his team worked on the project, with their findings published in the journal Science Advances. As the team explains, most semiconductors — both organic and inorganic — are mechanically nonstretchable, which makes this discovery all the more impressive. Their research has produced “the first semiconductor in rubber composite format that enables stretchability without any special mechanical structure,” said Yu. 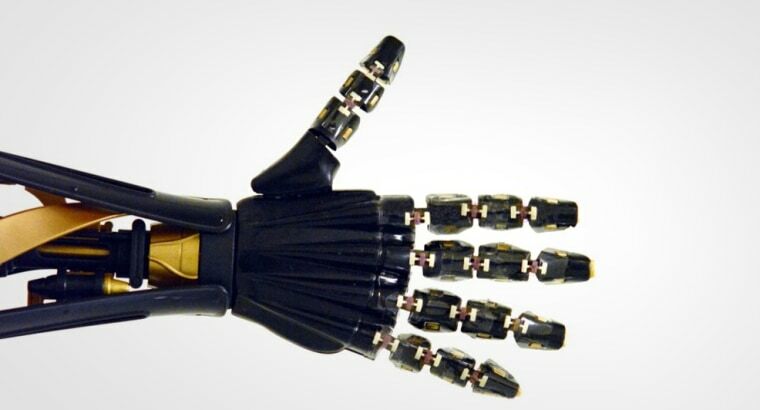 The artificial skin was made using a silicon-based polymer known as polydimethylsiloxane, or PDMS, and a hardened material made from small nanowires that’s capable of transporting an electrical current. The team’s process is relatively easier and more stable than a process using traditional semiconductors, which are brittle and more complicated to work with. “Our strategy has advantages for simple fabrication, scalable manufacturing, high-density integration, large strain tolerance and low cost,” said Yu. In a demonstration to show its effectiveness, the robotic hand covered in the skin was able to sense hot and iced water temperatures. Another test had the hand receive computer signals, which it then translated into American Sign Language. The artificial skin is just one way to use the material. As work on the stretchable electronic progresses, its expected to be able to positively impact the development of other wearable electronics, eventually leading to more sophisticated health monitors, surgical gloves, medical implants, and human-machine interfaces.